Comfort reminiscent of a luxury car with truck utility. The 2019 Ram 1500 Laramie offers comfort reminiscent of a luxury car, but offers plenty of truck utility. Pickup trucks are hot now and no truck is getting more attention than the Ram 1500, which is ringing up scores of plaudits. The honors, among them North American Truck of The Year for 2019, are well deserved. For anyone who has driven traditional pickup for work, climbing into the cab of a Ram 1500 Laramie is a revelation as it has the kind of comfortable luxury one traditionally associates with full-sized luxury sedans. In addition, the Ram 1500 is loaded with the latest in technology and delivers a surprisingly smooth ride as the engineers at Fiat Chrysler Automobile N.V. build on the suspension of the previous generation Ram 1500. The new Ram 1500 Laramie's handling is aided by a slew of driver assistance technologies. The updated ride and handling in the Ram 1500 maintains that smooth ride on all types of road surfaces. Moreover, the truck can easily go off-road or through mud or heavy snow when necessary. The smooth ride on pavement, however, calls to mind driving an expensive sedan with a good suspension. In addition to the comfortable ride characteristics, the Ram 1500 also is surprisingly easy to maneuver, offering the driver plenty of control even in sudden stops or situations where the truck has to go left or right around another vehicle. Even when the brakes are applied hard the bounce in the rear axle is tightly controlled. The overall handling of the truck is bolstered by the driver assistance features such blind-spot detection. Emergency braking also is available on the Ram 1500. The Ram 1500 Laramie is powered by 5.7-liter Hemi and is equipped with 8-speed automatic transmission, which is practically invisible as it shifts through the different demands on the 4X4 powertrain. The Hemi furnishes 395 horsepower and 410 lb.-ft. of torque effectively and efficiently and is equipped with performance-enhancing and fuel-saving technologies that include variable-valve timing and cylinder deactivation that combine to deliver 15 miles per gallon in the city, 23 mpg on the highway and 18 mpg combined. With Fuel Saver Technology, the engine control computer turns off fuel and spark, and closes the valves to four of the engine’s eight cylinders during light load operation, according to FCA’s engineers. 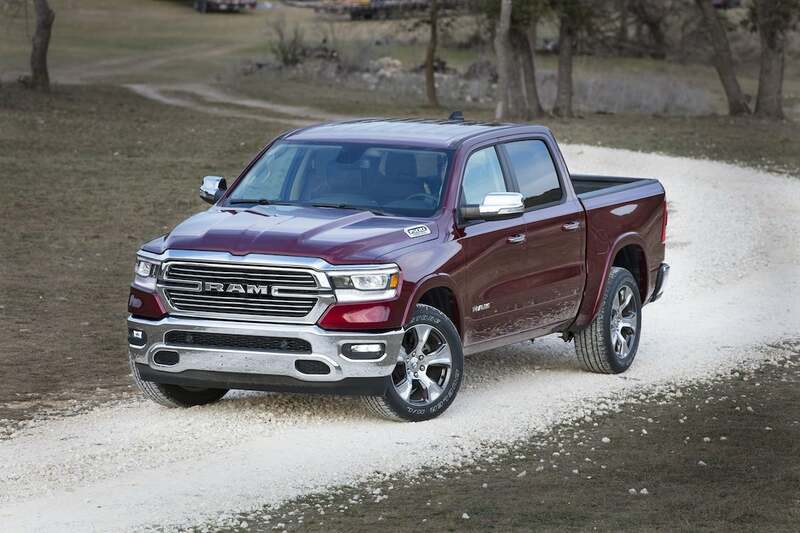 The 2019 Ram 1500 is powered by a 5.7-liter V8 Hemi putting out 395 horsepower and 410 foot-pounds of torque. 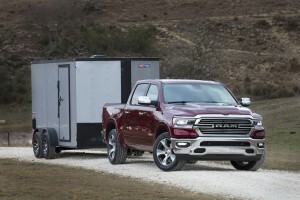 For the 2019 Ram 1500, FCA engineers broadened the operating zone of the Fuel Saver Technology via the addition of a pair of active vibration dampers, mounted on the frame, and Active Noise Cancellation technology in the truck cabin. The expanded range of operation yields an additional 0.5 miles per gallon (mpg) on the highway. Transparent to the driver, the system operates between 1,000 and 3,000 rpm while continuing to enable V-8 power for acceleration and heavy loads. Another change for the Hemi V-8 in the 2019 Ram 1500 is the switch to an electric cooling fan, replacing the previous 400-watt electric/mechanical fan hybrid setup. Precisely controlled by the engine control computer, the new 850-watt electric fan, mounted to the radiator, matches the fan’s operation to the cooling demand. Eliminating the traditional fan blade mounted to the front of the engine helps improve fuel economy by reducing parasitic losses and fan noise. The end result helps minimize noise in the cabin, producing a less stressful environment and making it easier to enjoy the comfort and luxury built into the interior of Ram 1500 with its leather wrapped steering wheel and spacious center console, broad enough to spread out your lunch, or if necessary, your dinner. 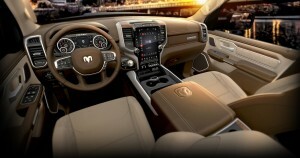 The interior of the Ram 1500 Laramie is comfortable and large with easy access to all controls. The dashboard in the Laramie contains a 12-inch screen in the center stack with controls for the heating and cooling as well as the entertainment system. The controls for entertainment, mobile phone and cruise control are all repeated on the steering wheel. The instrument cluster also comes with configurable screen with information about the vehicle. 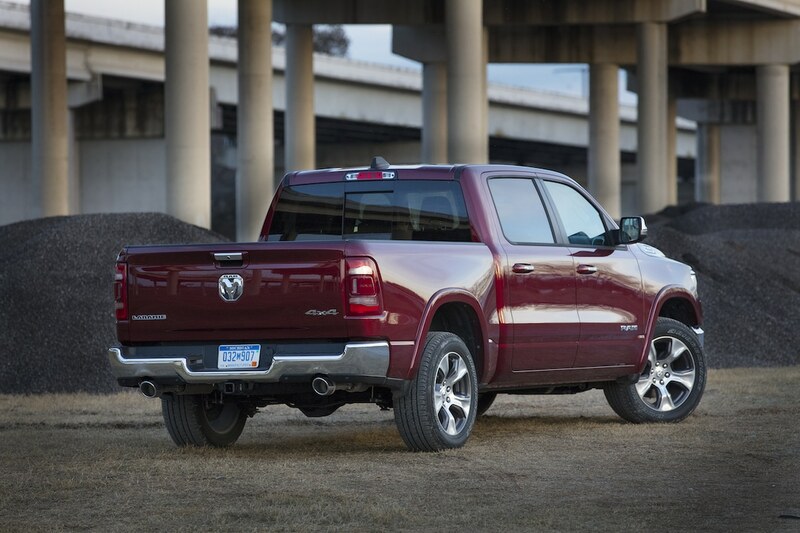 The overall weight of the Ram 1500 was reduced by 225 pounds. A 360-degree Surround View Camera with bird’s-eye perspective of vehicle and its surroundings as well adaptive cruise control that maintains distance between the vehicle and can bring vehicle to a controlled stop under certain circumstances and return to set speed when traffic clears and forward collision warning that alerts the driver if impact appears imminent and will help the brakes. 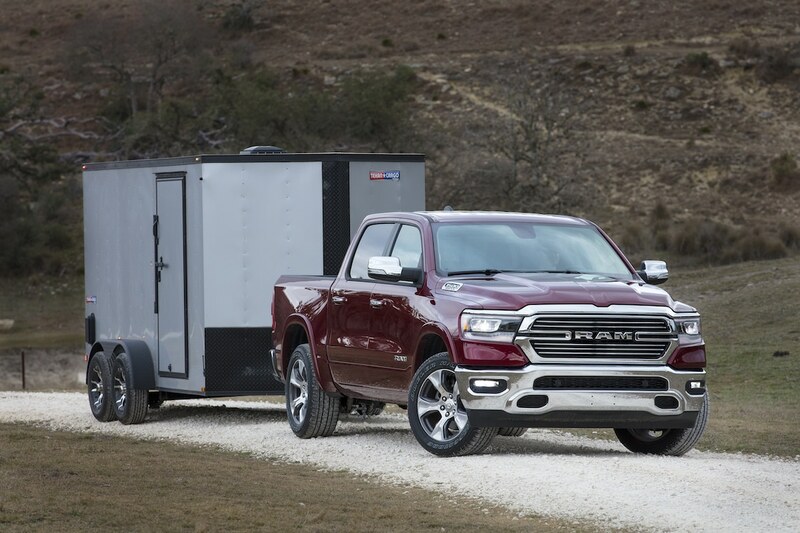 If used for towing, the Ram also is equipped with trailer-sway dampening control, a lane departure warning, adaptive front headlights, hill-start assist and park sense that utilizes ultrasonic sensors to help the driver ease into a parking space. With a price pushing $60,000 plus, the Ram 1500 Laramie also comes with a full array of comfort and convenience features that have migrated from passenger cars such a keyless entry, SiriusXM Radio, telescoping steering wheel, remote start and FCA’s U-Connect Access, which can also serve as a mobile wi-fi hot spot if want to pay the phone bill. The Ram 1500 Laramie is artfully designed and well-crafted vehicle that exudes American cool. But it is also larger than the trucks of 20 years ago and thus not all that practical in an increasingly urban world where parking places seem to have grown smaller and parking lots more crowded. So, unless the box in the rear of the Ram is used day in and day out carrying stuff as opposed just getting dusty or is used regularly for weekend excursions, it might not be the best choice as an everyday driver. 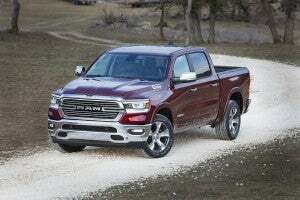 This entry was posted on Tuesday, February 12th, 2019 at and is filed under Automakers, FCA, First Drive, Infotainment, Markets, Pickups, Ram, Reviews, Safety, Safety, Technology, Technology, U.S./North America. You can follow any responses to this entry through the RSS 2.0 feed. Both comments and pings are currently closed. FCA, Ford and GM full size trucks are truly awesome. The import brands should just give up with their half assed offerings.